Or to give it its more up-market title, "Drilling Fluids Engineering". When drilling through rock nearly 2 miles down and up to 4 miles out to the side, you can't rely on speed of rotation (as you can with your average domestic pistol grip drill) to remove the cuttings from the hole. Instead, drilling fluid (or MUD) is pumped down the hollow drillstring which has the bit on the end, then out through the bit to flush away the cuttings and cool the bit. The cuttings are flushed back up the hole to the seabed, or in the case of most fixed platforms, all the	way up to the rig through a coaxial well casing. The formation below the Valhall platform is such that oil-based mud has to be used to prevent the rock surrounding the wellbore from becoming soft and mushy as it would if water based mud was used. This can't be discharged onto the seabed for 2 reasons: firstly, it is illegal for environmental reasons, and second, it costs far too much to throw it away. The mud arriving back at the platform carrying the cuttings is passed through huge mechanised shale shakers (like giant garden sieves) to remove the cuttings, then it is pumped back down the hole to do the job all over again. The job of Mud Engineering involves the preparation of the mud to a tightly controlled physical and chemical specification, chemically treating the mud to maintain the correct properties, ordering the chemicals used to make the mud, and testing of the mud properties to check that it is within specification. 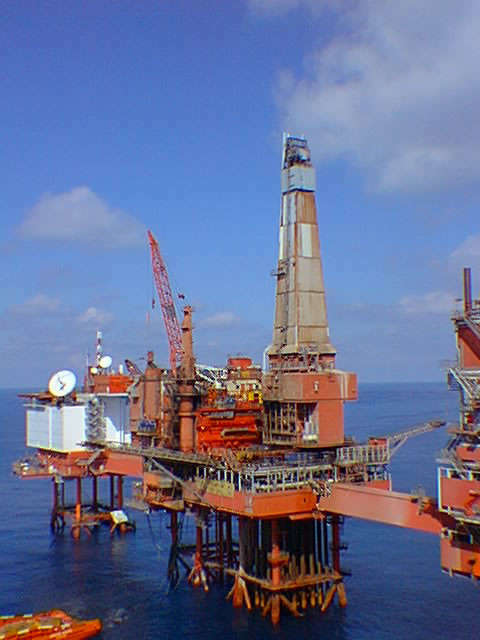 The picture above is of the Valhall platform (1997) in the Norwegian sector of the North Sea 200km due east of Edinburgh. It consists of three separate structures linked by bridges approximately 100m long. The far-away platform houses the quarters, catering, helipad and helicopter hanger. In the middle is the Drilling platform (where I worked) and just in shot to the right is the Production and Compression platform where the produced crude is separated into gas, oil and water. The gas and oil are pumped away - gas to Emden in Germany and oil to Teesside. The tall structure on the drilling platform is the derrick which works like a vertical crane. The top of the derrick is about 180feet above the lowest deck on the platform. The gap below the lowest (cellar) deck down to the sea is about 60 feet. The derrick is used to stack the drillpipe when not down the hole - each "stand" of 5" diameter drillpipe is about 95 feet long - these are screwed together to make up the drillstring which can be up to 7000m (23000') long. Obviously this gets to be a bit heavy! The "drawworks" (lifting gear) in the derrick can pull almost 1000000lbs (450 Tons). A huge amount of power is used when drilling - about 1MW for the drawworks, another 500kW for the "topdrive", the motor which turns the pipe (and therefore the bit), but most of all the mud pumps which pump the viscous drilling fluid all the way down to the bit and back up again - they can consume almost 3MW (there are 2 pumps on Valhall, 3 on Gullfaks C). I no longer work on Valhall - after the contract for Mud Services changed hands in 1999 I was transferred much further north, first to the Statfjord field for 4 years, then to the nearby Gullfaks field. The Statfjord field, which lies north-east of Shetland, is the largest in the North Sea and straddles the UK/Norway border. The 3 platforms on the Norwegian side where I worked are all concrete legged monsters. The helicopter ride out from Bergen is also much shorter at 1 hour compared with the 1 1/2 hours from Stavanger to Valhall. Oh, and the food was much better on Gullfaks! I retired from offshore work in 2011 but still (2017) do a bit of part-time consultancy work for an Ultrasonics company in Livingston (Diagnostic Sonar Ltd.).